Around the world, governments are sworn to secrecy about how much they pay for brand name drugs. The pharmaceutical industry insists on it so countries can't compare prices. But a Quebec bioethicist has won a small victory that might allow other researchers to start asking tough questions about drug prices. It took three years of fighting for access to confidential drug information, but a Quebec bioethicist has punched a tiny hole in the iron wall of secrecy surrounding patented drug prices. Two weeks ago, Jean-Christophe Bé​lisle Pipon won a long battle to force the Quebec Health Ministry to tell him how much it paid for a new meningitis vaccine (Bexsero/GlaxoSmithKline). The answer — $90 for the first 8,500 doses and $78 for the next 110,000 — was more than twice as much as the U.K apparently paid, and much higher than the price that Quebec officials deemed to be cost effective. He asked the original question to find out if a particular vaccination program was worth the price. But he might have also set a precedent that could allow other researchers to start asking tough questions about drug prices. Right now, contracts between governments and drugmakers don't allow people to find out how much their governments are paying for patented drugs. "If we want to work toward a more responsible world then we need to continue to force governments and especially industry to release such information," Bé​lisle Pipon told CBC News. The lack of transparency is a condition enforced by the pharmaceutical industry to prevent governments from comparing prices. "This speaks to the enormous economic and political power of the pharmaceutical industry in the world," said Steve Morgan, a health policy researcher at the University of British Columbia. Since 2004 he's been charting the growth of secret drug purchase agreements as they spread all over the globe. It works like this. When a pharmaceutical company brings a new drug on the market it publicizes a "list" price. But according to Morgan everyone knows that is not the real price. It's like the sticker price on a new car lot. It's up to the buyer to try to get a better deal. 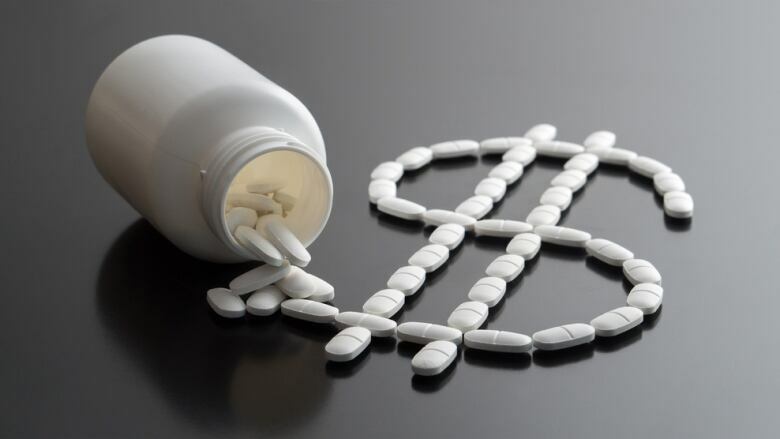 Pharmaceutical companies insist on negotiating separate deals with each buyer behind tightly closed doors. Government officials at the bargaining table are forced to sign non-disclosure agreements preventing them from revealing the final price. "In some of their contracts they're not even allowed to share the information within their own country with other branches of government," said Morgan, who has seen this fear of spilling the beans at an annual forum he hosts for drug plan officials from 15 countries. "You can see in the faces of the people around the table," he said. "You can tell the sense of angst. They felt they were being dragged into a system them didn't want to participate in. However they went in because it's the rational thing to do on behalf of the public they serve." The price reductions come in the form of rebates which the company agrees to pay back to the government. The terms are different in various jurisdictions but the common feature is confidentiality. Back in 2014, Bé​lisle Pipon had no idea that he was asking for such sensitive information. He was a bioethics researcher at the University of Montreal specializing in the intersection between business practices and health policy. He needed to know the price of the vaccine for a cost-effectiveness analysis on the 2014 meningitis vaccination program in Quebec's Saguenay-Lac-Saint-Jean region. He was shocked when the Quebec health ministry officials told him it was "third party information" that could not be released it without the pharmaceutical company's permission. And GlaxoSmithKline said "No." "It was weird that such information was not public." So he kept fighting, eventually ending up in front of an administrative judge at a provincial access to information tribunal arguing against government and drug industry lawyers. "In court it was difficult. I don't have any lawyer training, I represented myself," said Bé​lisle Pipon. But he won. Administrative Judge Linda Desbiens ruled that "commercial partners" of governments "must expect a degree of transparency in their relations with them. It is the concession to be made to be able to contract with the State." She ordered the health ministry to release the drug invoices to Bé​lisle Pipon. He finally received the information on April 20. Those documents revealed that the province managed to negotiate a deal that was significantly less than the list price for the vaccine, around $130 per dose. "It's lower than the listed price but it's still higher than what would make it cost effective," said Bé​lisle Pipon, who is now a postdoctoral fellow at the Petrie-Flom Center at Harvard Law School. Morgan said one aspect of the lack of transparency is that it's hard for researchers do cost-benefit analyses of provincial drug coverage decisions without knowing how much the drugs cost. "Transparency is a laudable goal that is going to be difficult to obtain if not impossible to obtain by a single country in the global pharmaceutical marketplace," said Morgan, who is participating in a discussion on international drug price fairness at the World Health Organization. "Canada can't change the world," he said. "We're only two per cent of the world market. We are in some ways stuck with this."